Parking: Lot 663 on Logan & Sunset (behind Stories), or street parking around Echo Park Lake and its side streets, or the side streets on the other side of Sunset Blvd (Logan, Lemoyne, Montana). 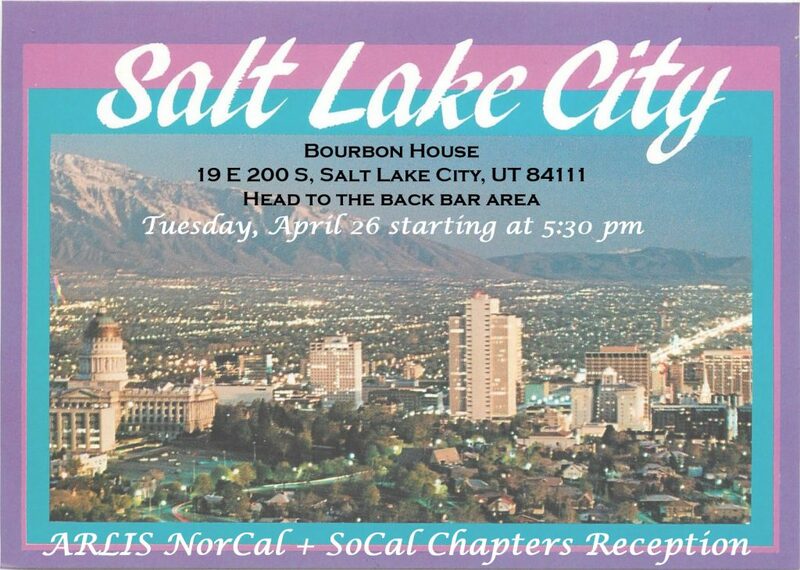 RSVP optional by Wednesday, April 10th (midnight). *Grab a button at the front door of the fair (3:00–3:30pm) to introduce yourself to other colleagues. Matt Austin is a Chicago-based artist, educator, and publisher. Matt tends to apply his approaches to art making in all facets of his life: working, teaching, getting older, having dinner, etc. Though his practices vary widely – from making photographs to publishing books, hosting dinners to building benches, his work remains focused on the importance of honesty and learning from others. Many of his creative projects are motivated by tragic experience and frequently engage the idea of learning to appreciate through embracing difficulty. Inspired by failure and often motivated by fear, he mostly demonstrates his enthusiasm for living by trying things out. Ariel Schudson (she/her/hers) is an archival activist, independent scholar and feminist film programmer who has been a member of the film, television and digital media landscape for almost 20 years. Currently you can find her working as the head film programmer/social media manager/website wrangler/you-name-it at the Downtown Independent movie theater in downtown Los Angeles. She has presented academic work centered on gender and media, subcultural dynamics, and audience theory at multiple academic conferences including Comic Con and Consoling Passions. She is the creator and hostess of Archivist’s Alley, a podcast platforming our colleagues in the archiving and media community who consistently go ignored due to the Rich Straight White Dude power structures in place. She received two MA’s from UCLA: one in Film, TV & Digital Media Theory and one in Moving Image Archive Studies. Her current project is a book about women and representation in Korean television (K-dramas). She has two cats that are the loves of her life (Eartha Kitten and Wallach) and a pretty decent 16mm collection. Yasmin Dessem is the Head of the Audiovisual Preservation Studio at UCLA Library where she serves as the technical lead as the library continues to develop its program of preservation, digitization and access of its moving image and sound holdings. Previously she managed archive deliverables for new feature releases at Paramount Pictures. Since 2015, as part of UCLA Library’s International Digital Ephemera project, she has partnered with heritage institutions in Cuba and South Africa to provide digitization and preservation training. She will be presenting on Recent Developments in the Preservation of Wire Recordings and Dictabelts at this year’s ARSC Conference, happening May 8-11 in Portland, Oregon. Artifacts is a group for UCLA Information Studies students interested in arts librarianship, visual resources, and museum informatics. ARSC, the Association for Recorded Sound Collections, Inc. is a nonprofit organization dedicated to the preservation and study of sound recordings. 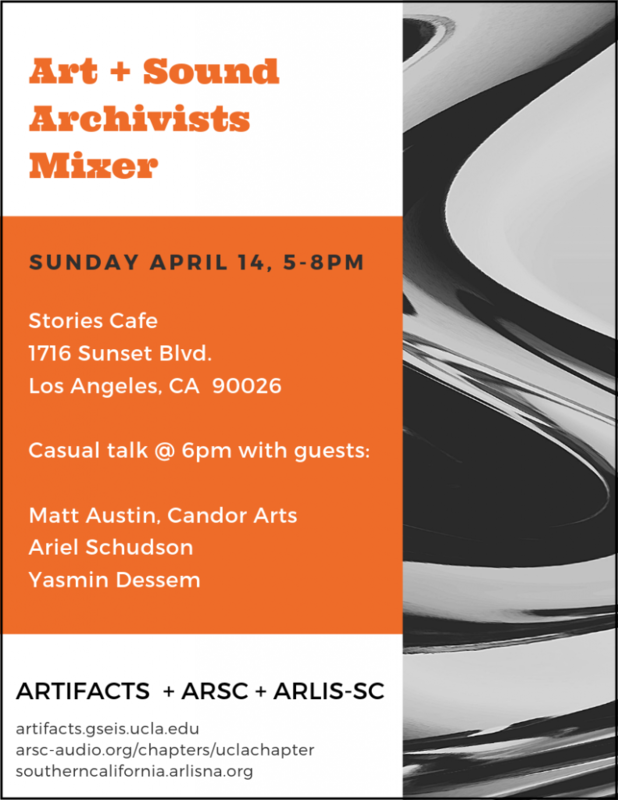 ARLIS-SC is the Southern California chapter of the Art Libraries Society of North America (ARLIS/NA), a dynamic organization of over 1,000 individuals devoted to fostering excellence in art and design librarianship and image management. Please join the ARLIS/NA Southern California Chapter on Wednesday, November 28th, 2018 for a web archiving workshop. Web archiving is a fundamental component of modern archival practice. As publishing has shifted from the print to the digital environment, archivists need to adjust collection policies to include important web-based content that is highly ephemeral and in danger of loss if no action is taken. For the art library community this content includes historically important materials such as web-based auction catalogues, artists’ websites, digital catalogues raisonnés, and museum websites. While most are familiar with the Wayback Machine available at archive.org, less are aware that there are a number of tools and services developed for organizations to create their own web archives. Web archives provide permanent URLs for citation and can show how a website has changed over time at a single URL, even if no longer available on the live web. This workshop will introduce participants (15-25) to basic web archiving concepts and challenges. Participants will have a hands-on opportunity to build a collection of content archived from the web, which can include their own organization’s web presence, social media, digital exhibitions, or topical content publicly available on the web. Following the workshop, participants will have a searchable archive available to them, including the option of downloading WARC files for long-term preservation or research. Mary Haberle is a Web Archivist at Archive-It where she provides partner training and support services. Her prior professional experience includes working with archival collections at the Academy of Motion Picture Arts and Sciences and Franklin Furnace Archive, Inc. Mary earned her Master of Library and Information Studies degree from McGill University and a Digital Archives Specialist certificate from the Society of American Archivists. Please note: Participants will be required to provide their own laptops to attend. The Broad museum has generously offered an exclusive “behind the scenes” tour for the ARLIS/NA Southern California Chapter, to take place on the morning of Friday, December 7th. To book the tour, the museum requires a confirmed number of attendees. Please register for this event by September 30th so we don’t miss this special opportunity. All details will be confirmed once the tour is booked. The tour is limited to 20 people. The 120,000-square-foot building features two floors of gallery space and is the headquarters of The Broad Art Foundation’s worldwide lending library, which has been loaning collection works to museums around the world since 1984. Since opening in September 2015, The Broad has welcomed more than 1.8 million visitors. Please join the ARLIS/NA Southern California Chapter on Friday, October 19, for our annual Fall Business Meeting in Santa Clarita/Valencia. We will tour the UCLA Film & TV Archive, CalArts Film Library, and host a talk by Kathy Carbone with a chapter meeting and reception to follow. View the complete schedule for the day and RSVP here. ARLIS/SC is the Southern California Chapter of the Art Libraries Society of North America. Our members include librarians, archivists, curators, and friends from the Southern California area, from San Diego to San Luis Obispo. UCLA Film & Television Archive is the second largest moving image archive in the United States after the Library of Congress, and the world’s largest university-based media archive. We are committed to the collection, restoration and exhibition of moving images. The Archive’s public programs can be seen at the Billy Wilder Theater in Westwood Village, Los Angeles. The Archive loans prints from its vast collection to cinematheques and film festivals around the world. Additionally, footage licensed from the Archive has appeared in many notable projects for the big screen, television and other media. Many items in the Archive’s collections can be accessed for research by appointment through the Archive Research & Study Center at UCLA. The Archive is a part of the UCLA School of Theater, Film and Television, a premier interdisciplinary global professional school that develops outstanding humanistic storytellers, industry leaders and scholars, whose diverse, innovative voices enlighten, engage and inspire change for a better world. The CalArts Library enables student and faculty artist/scholars to develop the skills necessary for creative exploration, critical reflection and lifelong learning, in an environment that supports and promotes the diversity of voices that encompass the CalArts community. The library offers a full range of academic reference and instruction services, and contains a collection of over 200,000 physical items in all formats and approximately 300,000 electronic resources, as well as a unique archival and rare-book collection. Kathy Carbone is a lecturer and researcher in the Department of Information Studies at UCLA. Her research and teaching focuses on contemporary art practices with archives and the intersection of archives, human rights, and social justice. Currently, she is working with an international team of researchers on the Refugee Rights in Records (R3) Project. Prior to working at UCLA, Kathy was the Institute Archivist, Performing Arts Librarian, and a lecturer at CalArts, where she taught courses in contemporary art practices with archives and music research and writing methods. She has published in the journals Archival Science, Archivaria, and Archives and Records and has forthcoming articles in the Journal of Critical Library and Information Studies and the Journal of Community Informatics. A former contemporary dancer, improviser, and choreographer, Kathy collaborated with musicians and dancers in theater and gallery based live performance events for over 25 years. She holds a Ph.D. in Information Studies, with a focus in Archival Studies from UCLA, an MLIS from Kent State University, an MA in Dance and Music and a BFA in Dance from Ohio University. Free and open to the public. Does not require registration. The archive—whether as institution, practice, source, concept, subject or object—has increasingly become a stimulus for and site of artistic inquiry, intervention, and production over the last 20 years, and contemporary art practice a realm for critically exploring (and often questioning and disrupting) the functions and nature of the archive; for contemplating time, memory, history, and identity; and, for reclaiming and reinterpreting, reconstructing and re-presenting the past to imagine and realize new ways of being in the present and future. Drawing upon the rich interdisciplinary archival art discourse generated by visual and performing artists, critics, curators, and theorists as well as scholars in the archival and recordkeeping field, this talk surveys and contemplates key artistic approaches and responses to the archive by a range of artists working across a variety of disciplines. The talk further reflects upon the ways in which artists foreground the materiality and relationality, affective and performative aspects of the archive, and how considering the archive as art and art as archive opens new relations and conversations as well as possibilities between diverse people and communities.